Blockchain Courses: Become A Future Tech Leader! Blockchain Courses: Become A Future Tech Leader! In the last couple of years, blockchain technology has gone from an eclectic hobby to the next big thing in finance and the demand for Blockchain courses has skyrocketed! Blockchain technology, which started as a means to send money from person A to person B, as designed by the still unknown Satoshi Nakamoto, has quickly become the hottest technology since the invention of the internet. What used to be the darling of underground crypto nerds has been embraced by some of the biggest companies in the world. In fact, a quick Google Trends search of the keyword “blockchain” will show you the level of public interest on the topic over the last 5 years. According to the graph, it looks like the interest peaked around 2017, however, it is pretty evident that the interest will peak again once the market goes up. Thanks mainly to Bitcoin and Ethereum, cryptocurrencies have become part of the general zeitgeist. They have opened up people’s minds to the possibilities of the blockchain technology. Not only are there multiple blockchain companies with billions of dollars invested in them, turns out that there are many big companies who have started toying with the idea of incorporating the blockchain into their system. Let’s check out some stats which will give you a good idea for the demand of blockchain technologies. The graph above gives you a good idea of how much money the ICOs have raised over the years. What we want you to look at is the amount by which ICO funding has increased year after year. In 2016 ICOs managed to raise $252 million. 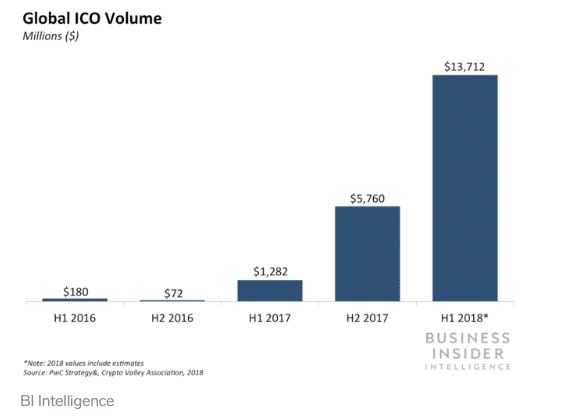 However, in 2017, ICOs raised nearly $7 billion and almost double of that in the first half of 2018 alone. Blockchain Courses: What do these numbers tell us? There is a huge demand for investment opportunities in the blockchain space. Turns out, that because there is so much money in the space, the sheer number of jobs available is pretty big as well. In fact, check out this stat by Angel.co. The number of listings by crypto companies have nearly doubled in 6 months. 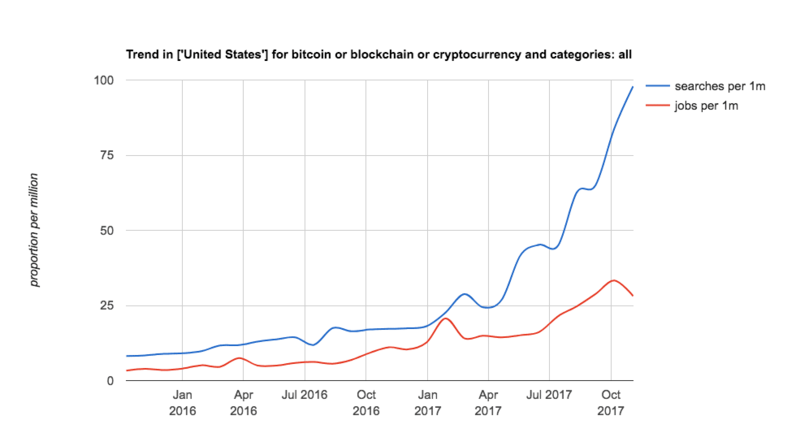 Since November 2015 Indeed has seen a 1,065% growth in searches for jobs mentioning “blockchain,” “bitcoin” or “cryptocurrency” on the company’s job search site. Job searches on Indeed mentioning “blockchain,” “bitcoin,” or “cryptocurrency” increased by 621% since November 2015. The following graph shows both the growth of job seeker interest in jobs with these keywords and the growth of job postings for jobs with these keywords for that time period. The meteoric rise of blockchain technology has led to a severe shortage of skilled blockchain developers. Towards the end of 2016, blockchain developer Jeff Garzik told Bloomberg that there were only about 250 true blockchain experts in the world. The current shortage means that knowledgeable blockchain developers can command high salaries for their work. The Wall Street Journal reported that some developers are receiving offers of up to $250,000 at-large financial institutions. 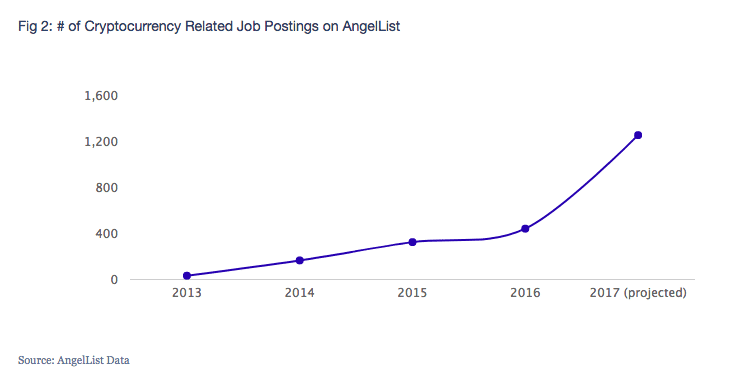 Even now, the demand for cryptocurrency jobs is as high as before. LinkedIn, the popular business social network, has seen the number of blockchain-related postings nearly triple in 2017. In order to meet this rising demand, the next obvious step to take is to have sources which can actually train high-quality blockchain developers. The job market is struggling to keep up with the sudden demand for blockchain developers. Because of the low supply and high demands, good quality developers can net a very sizeable income. So, how exactly do you feed this machine? Some universities and private companies have responded by offering a range of blockchain-related courses in an attempt to meet the needs of the industry. Turns out, that along with educating enough people to meet this demand, there are other reasons why it works in the favor of these universities and private companies to offer these courses. Blockchain technology is still in its infancy. This presents the universities a unique opportunity to become first-comers in the blockchain education field.Universities have the chance to get their names associated with “blockchain” the same way Harvard has gotten associated with “law” and MIT with “engineering.” Positioning oneself to be the dominant player in a space is something that any university would want to do. We are on the verge of entering the era of third-generation blockchains. Blockchains like Cardano, ICON, AION identify as the third generation. One of their most fundamental goals is achieving interoperability. In layman’s terms, it will enable interaction among various blockchains AND legacy companies. This is the reason why many people realized that blockchain training is just not relevant for blockchain developers exclusively. “Normal” employees should also train themselves in it to make sure that they don’t lose any ground as we move on to the next phase of our evolution. Shorter: An average certification course may last from anywhere around 6 months to 2 years. In some cases, it can be even shorter than that. A degree, on the other hand, will last minimum 2 years. Easily available: Most certifications are easily available online and can be done at your own time, pace, and location. However, degrees may require you to join classes, and follow the universities schedule. More focused: Certifications are more subject centric than degrees. Eg. if you are doing a certification on C++ programming then you are just going to learn C++. However, if you are doing a degree on Computer Science then you may even need to take up Environmental Studies or Mathematics for a semester. Cheaper: Obviously since certifications last for a shorter time, they are a lot cheaper than degrees. Less age restrictive: Usually college going students or people in their late teens to mid 20’s opt for degrees. However, people from all walks of life and age groups apply for certification because of the flexibility it provides schedule and location wise. Nearly 51,000 people earned the credential in 2010, a 46 percent increase in five years. For men, having certification adds a 25% to their income. For women, it is a 13% addition to their income, but that’s mostly because they were largely in less technical fields. According to research from Georgetown University’s Center on Education and the Workforce, about 3 percent of the workforce i.e. 4 million workers have certificates. As a leader in the blockchain community, we, at Blockgeeks, have organized our own courses to help people gain a greater understanding of the technology and prime them for excellent opportunities in the job market. We currently have two online courses run by industry leaders. These classes aim to bring students up to speed on blockchain technology, as well as give them practical skills that will help their careers. This Blockchain Certified Enterprise Accelerator takes students through the fundamentals, giving them a solid foundation that they can build upon, then moves on to more advanced knowledge, teaching them how they can apply blockchain technology in practical situations. By the end of the course, students will be able to create, connect and use their own personal blockchain in AWS. They will be taught how to use MultiChain Streams and also how to create their own blockchain applications. This is a practical course that teaches students all they need to know about building decentralized blockchain applications. Ethereum is one of the most promising blockchain projects and this series of online classes aim to give students important skills in revolutionary technology. By the end, they will be able to develop their own Ethereum-based blockchain apps. This is a focused course that is regularly updated with the latest developments in the Ethereum world. It takes a step-by-step approach in teaching students how to build their decentralized apps. It also includes a discussion board where students can talk to their lecturers for further information. Blockchain technologies are still in their infancy, but with many big projects on the horizon, the industry looks set to boom. Blockgeeks’ online courses are a great way for people to truly understand how blockchain works and get a foothold in the field. We even offer free trials so you can see if they are right for you. Blockchain technologies are still in their infancy, but with many big projects on the horizon, the industry looks set to boom. Blockgeeks‘ online courses are a great way for people to truly understand how blockchain works and get a foothold in the field. We even offer free trials so you can see if they are right for you.